They offer next day delivery (DPD). Stock is visible as you select size/colour options. Completed my order at 18:30 yesterday and they told me it should be with me today. Works out a great deal as I sold my iPhone 7 Plus which covered the cost of this handset and then increased my monthly fee up by £9 a month. Not bad for a new phone. Ordered mine last night. Thanks for the info. Got my original order email …Ordered mine last night. Thanks for the info. Got my original order email however still says processed and had no update regarding any delivery today Works out a great deal as I sold my iPhone 7 Plus which covered the cost of this handset and then increased my monthly fee up by £9 a month. Not bad for a new phone. This is the equivalent of paying £47.70 a month. That’s a great deal for a brand new high end handset. To all those iPhone haters who voted cold, you guys are mega nerds. Even if you hate iPhone, take out this contract and sell the phone immediately and voila you get a cheap contract that averages £6-£8 with at least 12gb of data and unlimited calls and texts. To all those iPhone haters who voted cold, you guys are mega nerds. Even …To all those iPhone haters who voted cold, you guys are mega nerds. Even if you hate iPhone, take out this contract and sell the phone immediately and voila you get a cheap contract that averages £6-£8 with at least 12gb of data and unlimited calls and texts. But being tied down to a 24 month contract, no thanks. is it on your christmas list? but hey, if it's free, why not? "I wear mine around my neck on a golden chain. a giant medallion of faith"
and finger it like a rosary"
"here darling i've bought you a crucifix and chain"
yuck! what sort of gift is that? who do you think i am? UGHHH, can I face going back on O2. Great having 12GB of data; if only you could use it. I bought this and it got delivered today. Just wondering - I read that the iPhone will lock to the first network sim you use (which in this case will be O2). On O2's site they say they won't unlock iPhone X until the device contract is paid off. But as our phone is paid over 24 months does that mean we can't unlock for 2 years? I've not inserted the O2 sim yet in case there is a workaround. 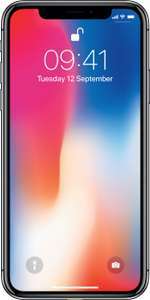 iPhone 8 Plus on o2 network £575 62 days old, I prefer android! I bought this and it got delivered today. Just wondering - I read that the …I bought this and it got delivered today. Just wondering - I read that the iPhone will lock to the first network sim you use (which in this case will be O2). On O2's site they say they won't unlock iPhone X until the device contract is paid off. But as our phone is paid over 24 months does that mean we can't unlock for 2 years? I've not inserted the O2 sim yet in case there is a workaround. I got mine yesterday, I've put a three sim into the phone it works fine. although i haven't tried it with another another network. from what i know three don't sim lock their phones (I could be wrong). With the o2 sim i've given it to my dad saves me a bit as i pay for his contract too. lol. I got mine yesterday, I've put a three sim into the phone it works fine. …I got mine yesterday, I've put a three sim into the phone it works fine. although i haven't tried it with another another network. from what i know three don't sim lock their phones (I could be wrong). With the o2 sim i've given it to my dad saves me a bit as i pay for his contract too. lol. Thanks - are you a Three customer and are you keeping the sim on Three permanently? I have a Three Sim kicking around but don't have any kind of plan with them and get bad reception with Three (O2 is better). If I put it in and it locks to Three would it be a hassle to unlock? I actually plan to use the O2 sim that came with it - it's just I sometimes need to use other networks' sims for work so would prefer the device to be unlocked. Yeah i would prefer to be on o2 if i'm honest but i travel to the US and Hong Kong frequently so i tend to use three. i plan on using China mobile when i'm in China in January. so i'll find out then lol. you could use this site imei.info but it seems they don't have the status of my iphone x. but they said my iphone 6 is unlocked which is correct. its free too. O2 deal was already posted last week and also discussed on the iPhone 8 deal thread for the same company; although you've also mentioned the Vodafone offer. However, that is a higher monthly amount, which you didn't state, hence the greater total cost over 2 years, in spite of the lower up front payment. Still the best X contract deals by a mile at present. Why? In case you get a better deal than £6-8 for 12gb, u/l and u/l? Not really gonna happen is it? O2 deal was already posted last week and also discussed on the iPhone 8 …O2 deal was already posted last week and also discussed on the iPhone 8 deal thread for the same company; although you've also mentioned the Vodafone offer. However, that is a higher monthly amount, which you didn't state, hence the greater total cost over 2 years, in spite of the lower up front payment. Still the best X contract deals by a mile at present. Yes I actually agree with you- people vote cold because it's Apple, and because of the high up front cost. I'm with O2 already and out of contract, and their nearest similar offer for me to upgrade to the X is 10Gb data, unlimited mins and texts for £39.99 up front then £72 a month for 2 years!! Needless to say I'm not going for that, so the Vodafone offer here is probably the best option for me as I can't go from O2 to 3rd party O2. Thanks so much for posting this. I unboxed mine around midday but I kept off putting the SIM in in case it locked. Having read your post I just activated with the O2 Sim and then tried an EE Sim and it worked fine too. Ordered and getting delivered tomorrow. Understandable how this deal is getting a bit of a thrashing but for the value of the phone and the airtime included......its an absolute steal. Yes you could argue the phone isn't worth £999 but each to their own. Personally i don't understand how people spend £500+ on a season ticket but its the way of the world. If you aren't interested in this phone then its pointless voting. People who are glancing over the deals and who do want a good iPhone X deal could potentially be missing out. Just been off the phone with o2. If anyone has checked their account and seeing 3Gb instead of 12Gb then they need to contact o2. 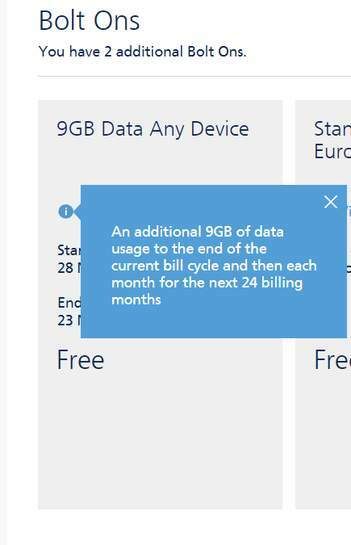 The guy stated that its a promotion running through mobiles.co.uk that stipulates that the customer gets 3gB+9gB of promotional data but only after the first month. I was a little perplexed as mobiles.co.uk don't really mention this anywhere on the page. Its only for the first month but you don't buy a car with three wheels in January, then wait for the fourth to be delivered in February. I logged into my online account and it says this on the bolt on . from what i understand it renews every month for 24months. am i right in thinking that? Yeah it renews every month starting from the second month matey. I was a bit confused but the person on the phone cleared the air. But cheeky on mobiles behalf though.